Some time between Saturday, October 13th and Wednesday, October 17th, there was a break-in at the range. 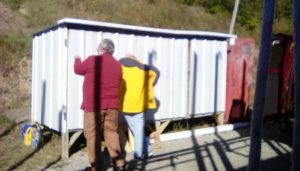 Someone decided that there was something of interest in the target shed in the pits and then took a crowbar to the left hand door and pried it off its hinges. The screws that held the hinges to the frame were ripped out and the aluminum facing was torn and bent. 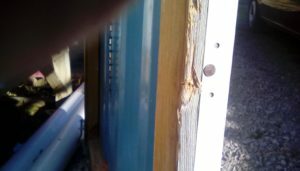 One initial thought was that wind had grabbed the door some way or another, but when we looked at the edge of the door, it was clear that someone had used a crowbar or similar tool to rip the hinges off the frame. The place that the crowbar was anchored shows very plainly in the picture. Temporary repairs have been made and new screws and additional hinges will be added. It only took two engineers to try to fix it and a schoolteacher to oversee the work. Members are asked to keep an eye out for things like this. Check the locks on buildings and storage sheds to make sure that someone isn’t shopping the range. 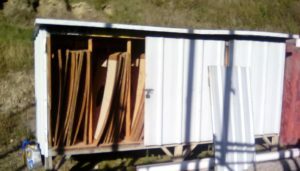 We can only assume that someone thought that there was something worth stealing in the shed – since there was nothing missing, I assume they were disappointed! After that was finished we went up to the new white building and looked at the heater to figure out why we had no heat. A spider had set up housekeeping in the combustion tubes for the heater – once he was evicted, everything works well again. Thanks to Mike and Glenna and Beard for taking time to fix up things like this.